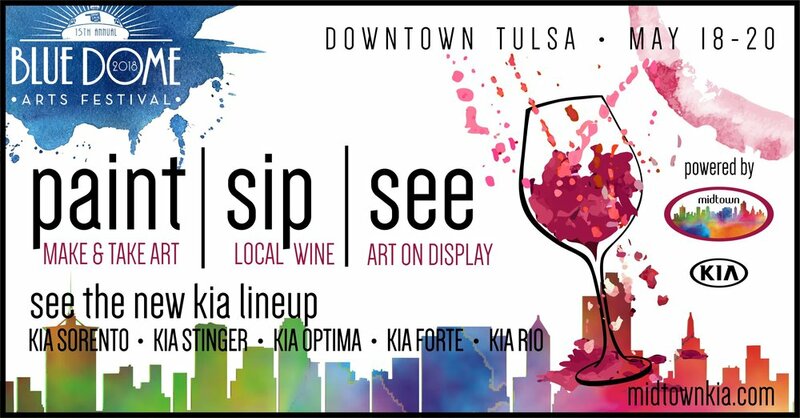 New to our 2018 festival is the PAINT | SIP | SEE area... powered by Midtown Kia! We are excited to be teaming up with artists from the Tulsa Art Center to offer paint & sip classes to festival guests this year while Pecan Creek Winery serves glasses of their award-winning wines. Enjoy a taste of their different varietals while checking out art classes or talking to our friends from Midtown Kia who will be showing off their new Kia lineup. That's right, you can scope out the new Kia Sorento, Kia Stinger, Kia Optima, Kia Forte and Kia Rio between your time painting, shopping, socializing and enjoying everything our 2018 Blue Dome Arts Festival has to offer this year! The PAINT | SIP | SEE area will be so much fun and we can't wait to enjoy it with you! Please visit our registration page to check out which classes are being offered, class descriptions, pricing info, wines and more. RESERVE YOUR CLASS and RESERVE YOUR GLASS today!